With its refined marina district setting, world-class amenities, spectacular dining, diverse entertainment options, and action-packed casino permeating the resort; one of the most infamous Atlantic City hotels, Harrah’s Resort Atlantic City Hotel & Casino has become a premier Atlantic City destination. Here you’ll discover all the first-class facilities and services you’d expect from top-notch Atlantic City hotels, and then some- an exceptional experience at great rates. Guaranteed. The resort boasts 2,590 luxurious guest rooms and suites, the Pool- a renowned year-round tropical entertainment complex, the award-winning Elizabeth Arden Red Door Spa, state-of-the-art fitness center, fabulous boutique and specialty shopping and more. Each of Harrah’s guest rooms and suites provides magnificent city and bay views, boast a variety of amenities including high-speed internet access, iron and ironing board, coffee maker, and refrigerator to name a few -for your comfort and convenience, and exude world-class extravagance, giving guests an unparalleled experience like none other. Be sure to inquire about their pet-friendly guest room options. Seeking Atlantic City hotels with guest suites to impress? Consider reserving one of Harrah’s grand and dramatic suites featuring elegant amenities including wet bars, private dining areas, floor-to-ceiling windows and state-of-the-art entertainment systems – an indulgent experience second to none. 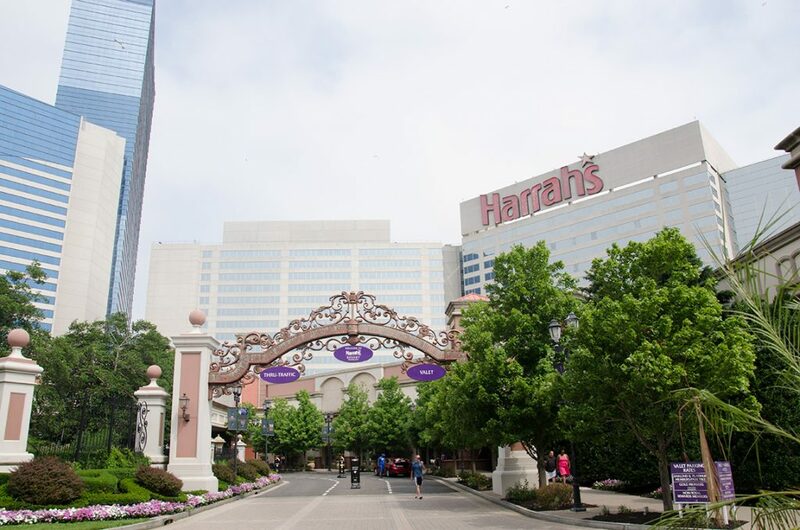 Ranging from cozy little cafés including Starbucks to the finest steakhouses to a trendy buffet, Harrah’s is a mecca for foodies among Atlantic City hotels. Tantalize your taste buds at Atlantic City Restaurant Martorano’s as you order up the Signature Eggplant Stack. Looking for a little spice in your life? Try Veracruz, where the menu is inspired by Mexican and Spanish street food. Or gather with friends and family at Coastal Craft, designed to be the ultimate social experience! The resort’s culinary choices will not disappoint. All restaurants welcome groups of all sizes and some offer private dining rooms. Harrah’s Resort Atlantic City Casino features 150,000 square feet of non-stop gaming thrill. Enjoy access to more than 2,150 of the latest and greatest video gaming machines, along with fast-paced table games and a poker room. If intrigued, Harrah’s is also the place for Atlantic City Video Poker. Count on for an almost-endless variety of events and entertainment to enjoy. Treat yourself to a comedy show or headline concert event at the 1,200-seat concert venue at Harrah’s brings you the best Atlantic City shows, concerts, and events of any Atlantic City hotels. Harrah’s Atlantic City has excellent options for after-hours entertainment. Relax with a perfectly crafted cocktail at Veracruz, Eden Lounge, Coastal Craft’s Bar, X Bar or #BARWITHNONAME. And don’t miss The Pool, offering unique party experiences day or night such as beach parties, pool-side spa treatments, and live musical entertainment. In the evenings, The Pool transforms into the hottest club scene in Atlantic City, with live DJs spinning all night long. Enjoy an indulgent escape as you savor every moment spent at the state-of-the-art Elizabeth Arden Red Door Spa. Relish a quiet moment of serenity as you choose from a diverse menu of signature spa and salon services, including skin care, massage, body treatments, make-up artistry, hair design and more. The spa also offers poolside massages in the cabana area. After your reviving treatment visit the spa café and the full-service retail boutique and beauty department for a little something to take home with you. Adore the eclectic findings of boutique shopping? Visit the Waterfront Shops, a stylish place that offers shopping at its finest. Shops include Destinations, Park Place Jewelers, Studio, Studio Shoes, Swarovski Tropicana Atlantic city, Swatch and Top Drawer. A must do experience for the inner Chef in you… the Viking Cooking School—a store and a school featuring a hands-on teaching kitchen and a retail store full of the finest culinary tools available. Browse the retail store and pick up Viking cookware and cutlery, countertop electric appliances and much more. The Viking Cooking School also offers an elite private dining room. 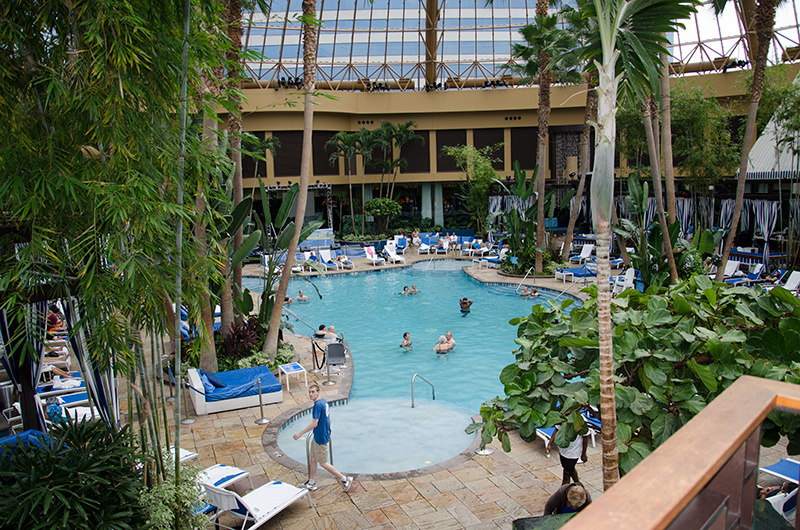 The Pool at Harrah’s Resort is an indoor tropical oasis by day and chic party spot by night. Under a 90-foot-high glass dome, it’s always 82 degrees and the water is warm 365 days a year. The four-acre complex includes a 23,000-square-foot, 86,000-gallon heated mineral pool, seven hot tubs, 12 cabanas, indoor and outdoor deck areas and a pool bar. For leisurely fun, enjoy miniature golf, shuffleboard, a game of pool and arcade games at the Family Fun Center. Whether you are planning a conference, family gathering, an epic girl’s getaway or a romantic weekend, Harrah’s Resort Atlantic City Hotel and Casino has something for everyone and will certainly serve as your ideal home away from home.